Click click. Refresh. Click click click. Refresh. 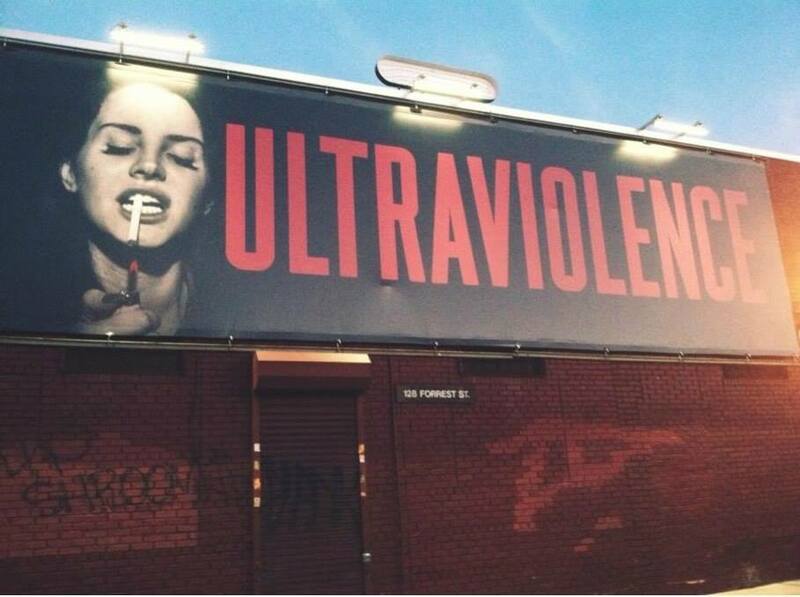 This is the mindless repetition that fans of singer-songwriter Elizabeth Grant, better known by her stage name Lana Del Rey, have burdened upon themselves since new billboards in Brooklyn promoting the musician’s new album Ultraviolence, due perhaps as early as May 1st, emerged this week. Reports that radio stations received copies of “West Coast,” confirmed as the first single off Del Rey’s second LP, has sparked speculation throughout the blogosphere that the highly anticipated track will either hit iTunes or be leaked shortly. Still, even if you’re not stalking her Twitter, Lana Del Rey is a tough gal to ignore. Maybe you don’t listen to the radio, but Del Rey will be projecting her soft airy vocals at Coachella this Sunday, April 15th, as well as pushing her cinematic sound, or self-stylized “Hollywood sadcore,” onto the silver screen in Disney’s upcoming film Maleficient. Yes, the beautiful songstress has come a long way since performing in NYC nightclubs, an appropriate beginning given her sound profiles like an older generation’s tell-all lounge singer. The Fordham University senior would sign a modest record deal in 2007 and move to a New Jersey trailer park to work with producer David Kahne. Her self-titled full album however would not be released until 2010, after which Grant opted to buy her rights back. Discovered by Stranger Records through her YouTube channel, Del Rey’s debut single “Video Games” followed, a breakthrough which would earn her accolades as well as a joint deal with Interscope and Polydor to release her second studio album Born to Die. Through her low and smoky timbre matched with her Mariah Carey-like appeal, Del Rey now has numerous chart-topping hits exploring the darkness of addiction and romance, garnering her several MTV, BRIT, and Grammy awards. Although some have dismissed Del Rey as just another pretty face, some calling her lyrics antifeminist, her momentum has made these criticisms all but irrelevant. Lana Del Rey has a following, and it plans on being along for the full ride. Wherefore Art Thou, Kurt Cobain?